Lebanon's interior minister has claimed a terror cell attempted to blow up a flight from Australia with bombs hidden in a Barbie doll and a meat grinder. He said Amer Khayyat planned to detonate an improvised explosive device 20 minutes into an Abu-Dhabi bound flight with 400 passengers onboard. The plan was allegedly only aborted after the luggage containing the devices was deemed overweight. Four men were arrested in Sydney counter-terrorism raids in July. Two were released but Lebanese-Australian brothers Khaled Khayat, 49, and Mahmoud Khayat, 32 were charged with "preparing for, or planning, a terrorist attack". 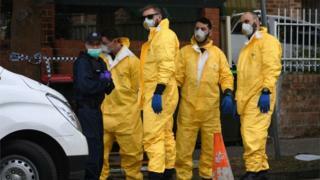 Australian authorities at the time confirmed the arrests related to a credible plot to bring down an aeroplane. It then emerged the target was an Etihad flight from Sydney on 15 July. Australian Federal Police (AFP) Deputy Commissioner Michael Phelan described the plan as "one of the most sophisticated plots that has ever been attempted on Australian soil". Image caption Mr Phelan described the IEDs as "high military-grade explosives"
He said components for the IED were sent through international cargo from IS members to the men in Australia. It is claimed a fourth brother, Tarek, is a senior member of the so-called Islamic State in Raqqa. Does a surge in airport security help? At a news conference on Monday, the Lebanese Interior Minister Nohad Machnouk said Amer Khayyat was forced to abandon the plan and to travel to Lebanon without the luggage after the bag was deemed overweight. His story contradicts Australian authorities who previously claimed the travelling brother had the bomb planted on him unknowingly. The minister said his country co-ordinated extensively with the Australian government over the plot. He also claimed the brothers had been under surveillance for over a year since their brother travelled to Syria. The arrested brothers were then said to begin planning an attack with an "improvised chemical dispersion device" after the initial bomb plot failed.